March of Industry has a subtitle of “Very Capitalist Factory Simulator Entertainments,” which doesn’t really need much in the way of explaining what the game is about. The game is short (can be beaten in an hour), but if you’re into building simulators this game might be up your alley. You start out in a small warehouse and you have the ability to buy raw materials and machines to turn those raw materials into other combined raw materials. You can then take those raw materials and turn them into guns that you sell for money. Pretty straightforward. The cool thing about the game is that you can build interesting combinations of raw materials and combining materials to build other items that combine into better and more expensive weapons. 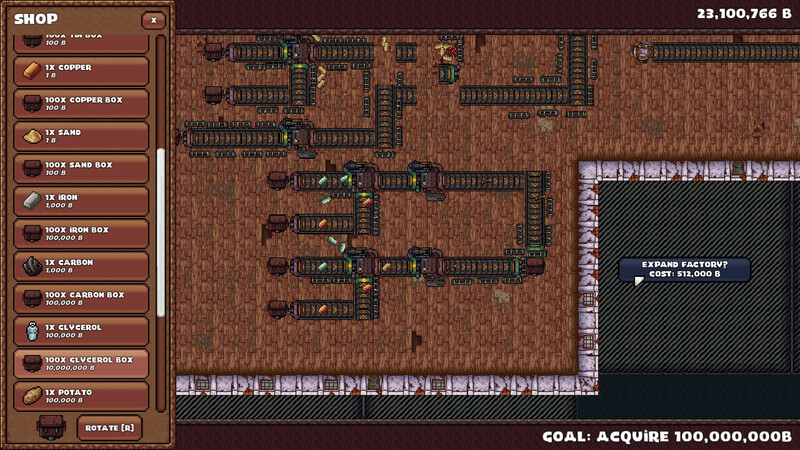 You can also construct conveyor belts to deliver the materials to the machines and automate your own weapons plant. Given that there are multiple formulas for creating materials and weapons, you can spend a bit of time in this game, but it lacks real staying power overall. In-game objectives are generally simple things like “build (x) weapon using (material x & y)” and the discovery part of the game is when you have to figure out how to manufacture the materials from what you have available. It’s a nice 2-part extension of the game to figure out the machine you’ll need to build to get the correct raw materials, and then you assemble a machine off that to build the weapon to sell. But after that it becomes fairly repetitive mouse clicking, and that’s when it loses the fun factor. I was able to build a fairly simple machine that built katana launchers at a pretty rapid rate. 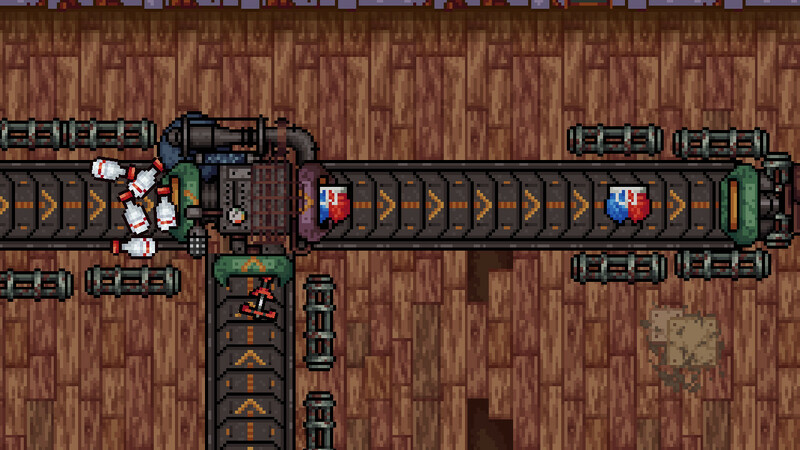 Buying a box of each material (1oo per box) meant I could assemble a box unloader and loader for the belt and just let it manufacture all the weapons while I sat there. Sell the full box at the end of the belt, re-buy materials and repeat the process. As I said above, you can complete the entire game in about an hour, hence the reason it lacks much replayability. I managed to complete several money-earning related tasks with that two-part machine, there wasn’t any true drive to make me want to keep making things in game to complete other objectives. I’ve never been a big fan of simulators though, so that certainly applies. It’s a simple game, and it’s easy to get the gist of it quickly, which leaves more to be desired. If the expectation of the developer is on the player to mod the game to make it last longer, then it absolutely becomes a game I won’t enjoy. Not being a “modder,” that idea doesn’t appeal to me, and perhaps the people on the game forum are feeling the same way. Overall I think the game is pricy for what it is, but perhaps maybe there needed to be a better explanation of what you were getting for the price tag. The announcement trailer video is below for you to see some of the game in action.